According to the Ohio Department of Health, the leading cause of infant death in Ohio is preterm birth (30%) followed by birth defects (19%) and sleep-related deaths (<14%). Current data states that the state of Ohio ranks 39th in the country for infant mortality! Moms2B is here to help women at high risk for infant mortality learn tools that will enable them to make healthier choices and deliver healthy, full-term infants. Learn how to have a healthy baby and pregnancy, talk with healthcare professionals, share a meal and make new friends at a Prenatal Education Session. Sessions are held every week, and we provide transportation assistance, free child care and incentives for attendance. Many dedicated volunteers and generous individuals and corporations donate their time and dollars as well. Our ultimate goal is to make a difference one baby at a time, and in our first four years, we joyfully welcomed hundreds of new babies into the Central Ohio community. For more information about the program, call 614-292-1605. Please direct all media inquiries to Public Affairs and Media Relations at 614-293-3737. Targeting Central Ohio zip codes with the highest infant mortality rates, Moms2B provides weekly education and support sessions to high-risk pregnant women to promote healthier lifestyle choices and link them with social support resources. The goal of Moms2B is for all participants to deliver healthy, full-term infants that live to celebrate their first birthday Moms2B encourages all pregnant women to participate and invites them to remain in the program until they are one year postpartum. Moms2B educates through a multi-disciplinary team approach. Healthcare professionals including doctors, nurses, social workers, dietitians, lactation counselors, and healthcare students educate on maternal and infant health topics. Each program session is delivered in a supportive environment, encouraging and empowering moms to take ownership of their choices, often leading to new found independence after the baby’s delivery and beyond. Moms2B even provides a healthy and hot meal with every session to supplement the diets of participants, as 85% report experiencing food shortages at home within the past year. On-site child care is also provided for all program participants; this allows moms to engage and interact not only with the education, but also with fellow participants. Pre-registration is not required. Please call 614-292-1605 for more details. Reducing prematurity results in a significant cost avoidance for the Medicaid program. The medical costs for a premature or low-birth weight infant is approximately $55,000 in the first year of life alone. Whereas the medical costs for an infant born full-term is less than $4,000 annually. With our impact on decreasing the number of babies born low-birth weight, we estimate a cost savings of $300,000 per year. Knowing that stress impacts infant mortality, Moms2B provides the education and resources pregnant women need to relieve issues related to housing, finances, food insecurity and transportation problems so they can have the healthiest pregnancy possible. 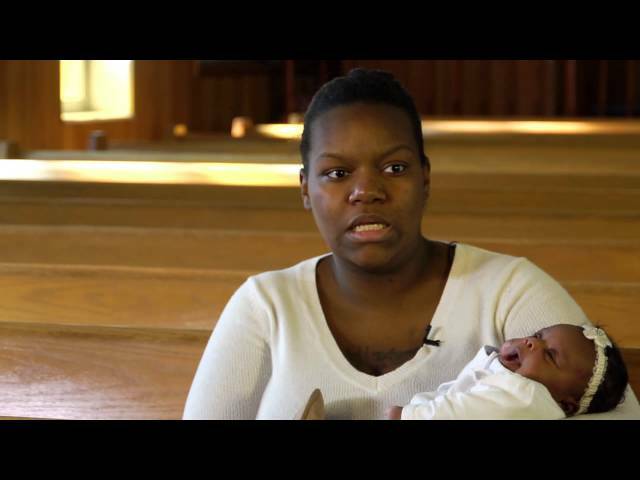 New moms who have benefitted from this support share why it matters. The beginning of each Moms2B session includes a “Sister Circle,” when moms and visitors introduce themselves, tell more about their pregnancy or baby, and discuss a question related to the topic of the day. It’s an opportunity for moms to be heard, get to know one another, and gain confidence speaking in front of others. So that expectant moms can truly focus on the Moms2B session they're attending, trained childcare professionals provide special programming for siblings, from infant through middle school age. This provides a wonderful opportunity to assess each child's individual progress. Learn how to have a healthy baby and pregnancy, talk with healthcare professionals, share a meal and make new friends at a Prenatal Education Session. Sessions are held every week, and we provide transportation assistance, free child care and incentives for attendance. Call us at 614-292-1605 to learn more. Learn how to have healthy baby and pregnancy, talk with healthcare professionals, share a meal and make new friends. Our need is great and our gratitude is immense. As a self-sustaining program, Moms2B relies entirely on donations and grants to cover all operating costs. Mothers attend free of charge. 100% of every gift or donation supports a new mom and her baby and is completely tax-deductible. If you prefer to donate supplies, you can make an appointment to drop items off at the Moms2B office at 921 Chatham Lane, Suite 108, Columbus, Ohio 43221. Supplies we accept that will be given directly to a mom-in-need are listed below. Moms2B welcomes the assistance and support of our community members. If you are interested in joining our team of volunteers, please email Moms2B@osumc.edu or call 614-292-1605 for more information on our application process. Childcare: Join other staff and volunteers to read, sing, play with and love our littlest visitors while their mom attends her Moms2B session. Food Preparation: Kitchen help is needed to prepare and serve meals to our Mom2B moms at each session. Our greatest current need is Monday afternoons and Wednesday mornings. Host a baby shower with your friends or community group. We can supply a list of vital baby needs for our programs and ensure that your donation goes straight to a mom-in-need. Host a diaper, baby book or gift card drive. Make and freeze heart healthy meals as a special treat for our moms. The Moms2B team will make sure they are safely delivered. Help us collect and assemble emergency food bag items. Many of our Moms are food insecure and need food to make it through the week. Moms2B provides weekly education and support sessions to promote healthy lifestyle choices and link Moms with support services. Our education topics focus on: breastfeeding, child development, family planning, goal setting, labor and delivery, maternal-infant health, positive parenting, reproductive health, safe sleep and more! In addition to Moms2B being FREE to attend, our “bonus features” include a $5 Kroger gift card for attendance, transportation assistance, on-site childcare and a hot, healthy meal. We also spend a lot of time connecting our Moms to other Columbus-based programs for assistance. In 2016, Ohio experienced 1.9% increase in infant mortality compared to 2015. Recently featured on NBC4 news (WCMH- TV Columbus, Moms2B is working to change these numbers! Moms2B is a proud member of the Kroger Community Rewards Program. Enroll today and help Moms2B support Columbus area mothers overcome social determinants of health and raise healthy, happy babies!